Data East’s Karate Champ is praised for being the game that both established and popularised the one-on-one fighting genre, which had reached heights by the early 90s. Additionally, it had further used the ‘best of three matches’ format and training bonus stages that could also be found in later games within the genre. The cabinet had a dual-joystick mechanic and showed some early signs of speech synthesis within the game, with phrases such as ‘Fight’ and ‘Winner’ being included. 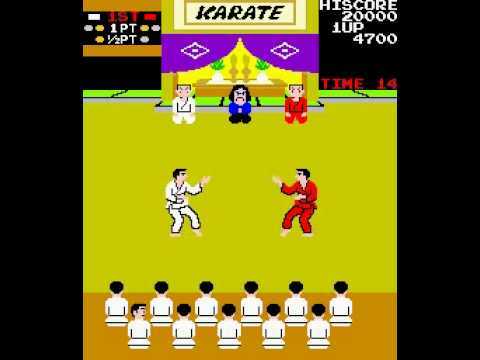 Furthermore, a second game was brought out later in 1984 titled ‘Karate Champ: Player vs Player’, which was a two player version of the original game. 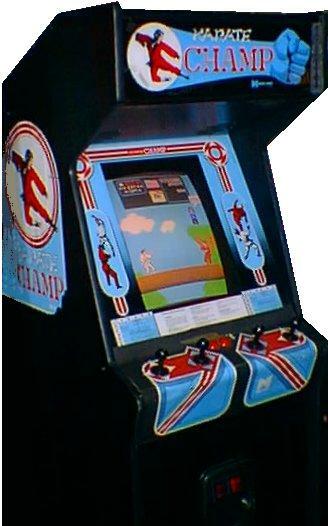 Within the gameplay, the player would control one Karate champion that fought against the computer or another player (in a later version of the game). Various bonus rounds were awarded to the player who had been successful throughout the gameplay, which included training rounds. As in most games, the more the player developed through the game the levels increased in difficulty and with new backdrop scenes. Unlike later games within the genre, Karate Champ lacked a health bar or hit points. Instead, when the component was successfully hit, the round ended and the player would gain either half or a whole point. Due to the three round dynamic of the game, the first player to win two rounds of the game was deemed the winner. Meaning that if the player was beaten the game would end. The Player vs Player edition of the game was shown to be nearly exactly the same as its predecessor, with only minor changes. This was seen in improvements to the speech synthesis and better controls generally and over the hit direction. The two-player game was now set in different locations around the world as the players fought for women. 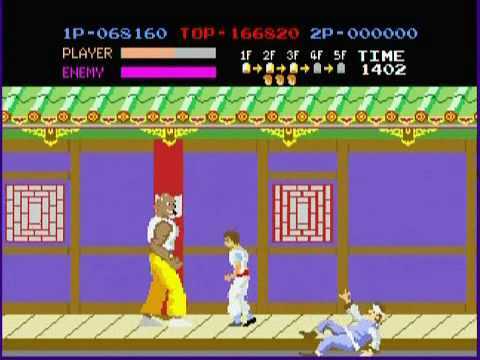 Kung Fu Master was a Japanese martial arts, side-scrolling video game. The game was produced by IREM but designed by Takashi Nishiyama who also designed the first of the Street Fighter games as well as creating the NEO GEO arcade system board. The game was originally meant to be a video game of Bruce Lee’s film ‘Game of Death’. However, during production, the game was developed to be brought out in concordance with Jackie Chan’s film ‘Spartan X’ with the name changed accordingly for Japanese release. Due to this last minute adaption, apart from the names of the main character and his girlfriend, the game bared no resemblance to the film itself; which made it easy to get around licensing issues and therefore the game was mass-produced with the title changed to Kung Fu Master for worldwide release. The player would control the ‘Kung Fu Master’ Thomas, through five levels in the Devil’s Temple to rescue Sylvia (his girlfriend) from Mr X. The game was controlled by a four-way joystick and two attacking buttons. One button would punch and the other would kick, punching awarded more points for the player whereas kicking had higher damage. Multiple enemies were encountered within Kung Fu Master. These were in the form of Grippers, Knife Throwers and Tom-Toms. Grippers would grab the protagonist, draining his energy until they were shaken off by the player. Knife Throwers would, as their name stated, throw knives at the Thomas. These could be at high or low levels and the enemy would have to have been hit twice to defeat. Furthermore, Tom-Tom’s were shorter fighters who could either grab the player or jump onto the players head whilst they were crouching. Subsequently, the player would face a boss named the Sons’ of the Devil at the end of each floor within the Devil’s Temple. To add a further layer of difficulty, each floor had to be completed in a set amount of time; if the player was to run out of the time, the level would restart the entire floor. Alike many other games, if all five floors were cleared by the player, a more challenging version of the game would begin.